This play was first performed as part of a evening of short-plays in June 2005. 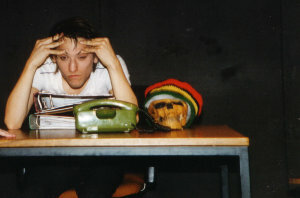 It was performed once again as part of a Shakespeare-centred evening of short-plays in July 2006. This is a sort of „alternative history” scene, created because I was always somewhat disappointed by the women especially in Hamlet. In my playlet, both Hamlet and Ophelia, (and both Romeo and Juliet) survive the tragedies surrounding their families. The two Italian teenagers are rescued from their final suicide attempts. And in my Hamlet-version Polonius is probably the only one who dies, since after her father’s death, Ophelia takes the initiative. Disturbed by recent events at court and dissatisfied with her situation on the whole she runs away and clandestinely attends university (we will have to imagine a modern setting), studies to obtain a degree in psychology with a specialization in conflict mediation and – imagine that events are not quite as rushed as in the “real” story – returns just in time to prevent Hamlet, Laertes, Getrude and Claudius from becoming the victims of a violent family struggle. Ophelia appearance is something nobody would have expected, after all, her family thought her dead because some time after her disappearance the body of a drowned woman was found near Elsinore castle. However, Ophelia proves her skill as a mediator and Hamlet and his family live on peacefully. More or less. Having finally found a vocation – or being merely dragged along by his more energetic girlfriend – Hamlet joins Ophelia’s psychology classes and after graduation both set out to work as psychotherapists. However, years pass and disillusion takes over: Ophelia invests most of her energy into her career. Hamlet, on the other hand, invests his energies into his clients, especially the female ones. And since Juliet’s marriage with Romeo has not turned out to be ideal either, one day Juliet becomes Hamlet’s client – and lover. Unfortunately, one evening Ophelia happens to – almost – surprise the two during an intimate… counseling session. Her suspicion is awakened and what she finds out is not at all to her liking. However, in contrast to her original Shakespearean self, she still refuses to accept defeat.